We are please to bring you news of our latest completed project. Brief project Description: The original roof sheet covering was suffering severe delamination and defective outer skin rooflights were reducing natural light whilst also being a fall risk due to fragility. 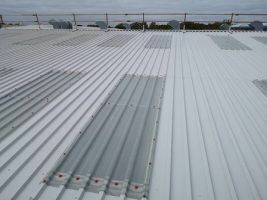 The client therefore required an effective solution to resolve these issues to extend the life of the roof covering whilst improving the internal work environment. 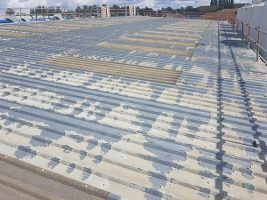 The solution was the removal of loose coating and power washing the steel sheeting in preparation followed by the application of a specialist Giromax paint system including silicone sealant to sheet end-lap details. GRP rooflights were replaced beforehand providing a complete non-fragile roof surface which in conjunction with our proposed permanent safety line system will provide safe future access when required.